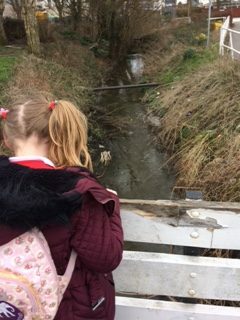 Next time you’re walking the children to school, popping to the corner shop or making your way to a doctor’s or hair appointment, keep your eyes peeled for local water courses – and roads with water-y names. Where I live in a small market town in Shropshire there’s a lovely little brook between Tesco and the swimming pool. Surrounding roads include Bridgewater Street, Brook Road and Watergate – and then there’s the White Lion Meadow car park. If you live in a rural area, the water environment is likely to be more obvious to the naked eye. But these little, urban local water courses also carry the history of their – your – community. They’re great for exploring with families, friends and dogs, and neighbourhood groups come together to protect them by picking litter. But more often, we walk right past them. Feargal Sharkey, of The Undertones fame, and a committed environmentalist, has been tracking some of London’s smaller rivers – check out his twitter feed here for some great photos and live updates. It’s intriguing to see how one little river can exist in both happy and less happy states on a single walk. Water Saving Week’s community day, sponsored by the Consumer Council for Water, is all about saving water in your community – and making it interesting and fun. You’d be amazed how simple steps you can take can help save water in your community – helping protect local water features (which many of us take for granted) for current and future communities – both people and wildlife. Every drop you save helps plants and wildlife in your local area – so knocking a minute off your shower time, or using a garden sprinkler only in the morning and the evening, will be appreciated by the local birds and fish. But by saving water you’re also protecting rivers and environments across your wider local area. For example, did you know that it takes 13 litres to produce 1 litre of petrol – so using your legs (or public transport) when travelling around your local community will save water, energy and money. Visit the Water Saving Week website for tips and some great downloadable packs and pledges. Take the family on a detective trail to track local water-y street names, and, if you can, the little brook or stream that inspired them – though sometimes these will be underground. Let us know how you’re getting on, and good luck. By saving water in your community you’re doing a good thing – for people and wildlife now and in the future.